The AMAZING dancer & singer turns 26 today!!! 「お誕生日おめでとう、翼！」I've admired you for a year; your charisma, your talent, your real smile... there is no one that I look up to more than you, baby, and I can't wait to watch you grow in the years to come ♥. kdl;jfa TSUBASA IS GORGEOUS ANY WAY YOU LOOK AT HIM ♥. But he does look rly rly good with short hair :333. *_* The icons are made out of all kinds of win! This post totally just started up my fangirl mode for him again. And I'll be stealing lots of photos and icons (I don't have even one Tsubi icon!! This is very very bad!) when I get home ^__- thanks a lot!! lksdjflskdj MISTY I HAVE BEEN ON HIATUS FOR LIKE, 12 HOURS. I will probably check my fangirl-filter and comment though :P BEING MISTY-LESS IS TOO MUCH! ♥ Please email me! You know what, I think everyone making an icon post for his birthday is using that first icon pic. lmao It was my first icon too. XDD Dramatic!Tsu = ♥. 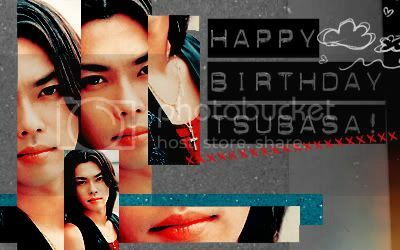 Lucky Tsubasa to be celebrated with so much gorgeousness! I just want them all. I can't pick a favourite. Maybe I can just keep cycling through them all. Thank you denwa! You are an artiste! Awesome icons! #3 in particular is absolutely beautiful, and #14 is just. LOL. I have a lot of admiration for people like you who can put text on icons and make it not look completely cheesy, as it always turns out when I try it. Man, I've seen pretty much all of those pictures before, but it didn't stop me from opening and oogling each one. XD Thanks for posting them! I just realized I never commented to this post!